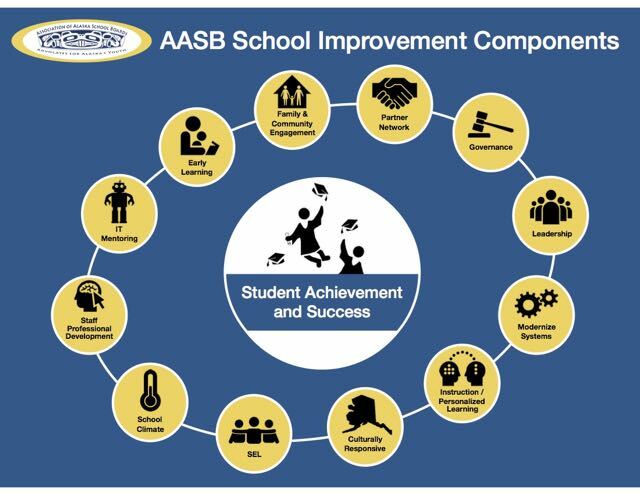 AASB has come to realize that a more holistic, integrated approach to school improvement that builds support and engagement by all stakeholders is the only sustainable, resilient approach to improving the outcomes for student achievement. This graphic below depicts those elements that we have identified as components important to positively affecting student achievement. If you have a need with regard to any of these components depicted, please contact AASB so that we can work with you to develop solutions to your challenges. We are just an email or call (907-463-1660) away!